**This photo was taken September 17, 2017 in North Myrtle Beach, SC. Having recently lost her mother and currently viewing the horrific devastation Florence is bringing to the Carolina coast, this reflection from last year is especially poignant to the photographer. 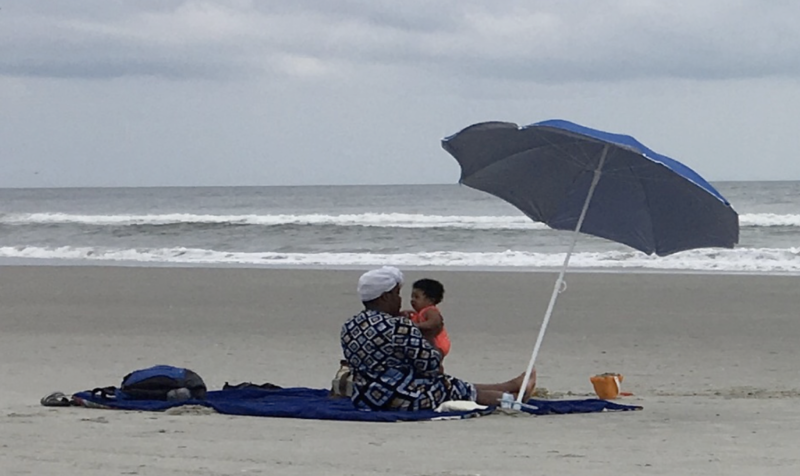 On a bleak and overcast September day in South Carolina, I came across this mother and child enjoying time by the Atlantic Ocean. I witnessed the tenderness this mother was pouring on to her child. This scene of a mama loving her little one summed up so much of life for me. In her actions, I saw unconditional love, pride, contentment, and protection. Symbolically I saw God looking on the face of humanity. I saw Mary taking in the miracle of a baby Jesus. And I saw the Holy Spirit swirling amid the ocean breezes and crashing waves. I got my camera out and couldn’t help myself from snapping some pictures. I carefully cropped the other beachgoers from the photo and felt I was looking at a sacred moment. Surely this is what it means to know God is always with us. Even in the bleakest times of loneliness and desolation, God is still with us. Admittedly I felt a twinge of guilt as I took the photo. I reasoned I was in a public space, and there are no copyright laws that prevent me from receiving such a picture. I eventually decided my thoughts on censorship gave me this feeling. I Felt (capital "F" Felt) this moment between mother and child was special, private, meant to be between the two of them only. I was, therefore, an intruder on their moment. As the photographer, I placed my uninvited self in their afternoon together. Was I authentically representing them in the photo? I believe I was. My only intention was to capture the beauty of God’s love reflected between mother and child. My soul was touched, and I wanted to honor the moment. In the world of visual art, we often find the use of symbolism to convey a deeper understanding of what lies beyond the surface. In other words, an artist may interpret a subject matter in a medium that best shows the intent behind the symbol they have portrayed. It follows, then, that the artist may or may not have adequately represented that intent in a manner that makes sense to the viewer. 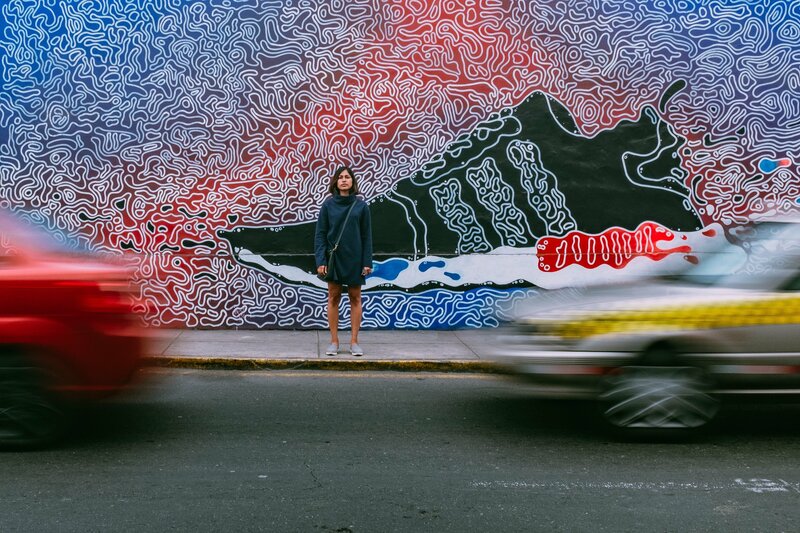 Next, in the artistic process, a viewer must step forward to partake of the art and put their spin on the intended narrative as they interpret it. How does the narrative change if we look at this same process through a camera lens? How can a photographer put meaning, symbolic or otherwise, on the subject matter they are “receiving” and more importantly, do they have the moral right to frame that “portrayal” in a way for others to authentically experience the subject? I reflect on the article “The Five Roles Arts Play” by Wilson Yates. In summary, Yates states that “A third role art plays during our spiritual journey is to raise religious questions about the nature and meaning of human existence, and in so doing, pull us into spiritual awareness.” When we sit down and tap into our creativity, we are accessing something bigger than ourselves. We are drawing on the collective knowledge of the universe as we have each individually experienced it. So if our framework consists of a stable spiritual upbringing, it follows that we see the world mainly from this same perspective. When we look at spirituality in the actions of everyday human existence, we are open to the reflection of the Holy in ourselves. Where humanity resides, the face of God is reflected. As the viewer, we do have the power to interpret the world through our lens. But as the artist, I believe we have the responsibility to share the moments we come across with reverence to the subjects we study and to portray them in the most authentic way possible. We owe it to ourselves to be true to what we receive in our line of vision and ultimately in the ways we share our art forms with the world. If we genuinely govern our artistic actions this way and genuinely look for the face of God in our everyday world, we are better equipped to offer real glimpses into public venues that show integrity and respect for any subject.